Tired of overdone maternity shoot concepts? 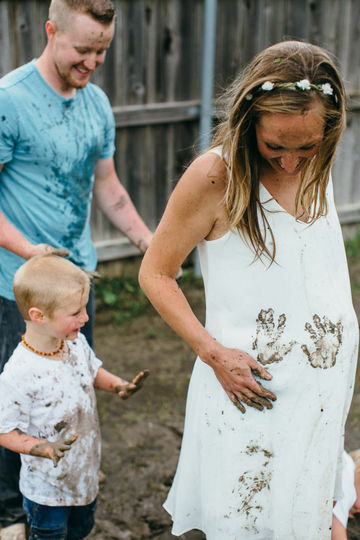 Then you'll love this cute family's totally original take on the classic photo op. Like so many mamas out there, Brittany Barton wanted to shoot maternity photos to commemorate her pregnancy—but unlike most pregnant ladies, she opted to do something very different than the typical ethereal outdoor pose or milk bath photo. 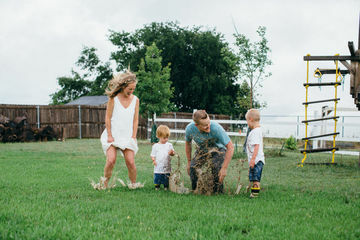 It's been rainy in Waxahachie, Texas, where Brittany and her husband, Jon, and sons, Declan and Noah, live. After rescheduling a few times because of the rainy weather, Brittany's due date was looming. Brittany didn't really have time to wait for a sunny day—so she kept her photo shoot date. It's a good thing she did, because the photo shoot, which featured Brittany and her family posed while covered in mud, turned out beautifully. 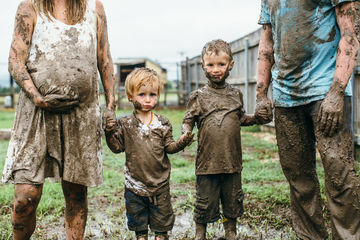 The photos that resulted from her rainy day shoot are original, offbeat and sort of the perfect representation of parenting—messy! Photographer Elaine Baca of Lane B Photography was on hand to capture them. "[Brittany] asked me what I thought about indoor locations, but they are outdoorsy people so I knew that wasn't really what she wanted," Baca told Fit Pregnancy. "Then I suggested something a little unconventional. They have a huge backyard which backs up to a field and I knew it had lots of muddy puddles, so I asked her what she thought about playing in the rain and ending with a mud fight. I don't think she even hesitated, she said she trusted my vision and wanted to go for it!" Baca also told us Brittany welcomed her third son, Matthew, just nine days after the photos were taken. "Maternity photo sessions are lovely. With parents swooning over a growing belly with baby in tow, a beautiful location, and well coordinated outfits—what more could you ask for?" Baca wrote in a blog post for the photos. "For me, photo sessions are all about preserving memories and making new ones. With small children it's about remembering their ever-changing personalities and quirks that make them unique. I hope that more families consider doing documentary-style sessions with little to no posing. With this genre of photography, parents don't have to stress about getting their little ones to sit still and look at the camera and kids get to be kids while doing something everyone enjoys."